Acarajé, a bean fritter fried in palm oil and filled with various toppings is one of the iconic foods of Brazil. We were spoiled for choice by the cheap and plentiful acarajé options in Bahia, where acarajé is most commonly found, (a complete Salvador acarajé post is coming soon). However, we are happy to report we found a great and centrally located acarajé spot in Rio de Janerio as well. Right in the bustling Largo do Carioca in Centro, Cida Acarajé sets up shop every weekday at around 12:30. It’s a pretty big production, so we are always impressed that it seems to pop up out of nowhere every day at lunchtime. An acarajé at Cida costs R$ 9 without dried shrimp, which is highway robbery by Bahian standards, but is largely in keeping with Rio’s generally inflated prices. However, this was actually some pretty good acarajé, so we were prepared to shell out a little extra money for one of our favorite Bahian treats. The acarajé are made fresh to order in a giant vat of dendê (palm oil) – which is absolutely imperative to a good acarajé experience. 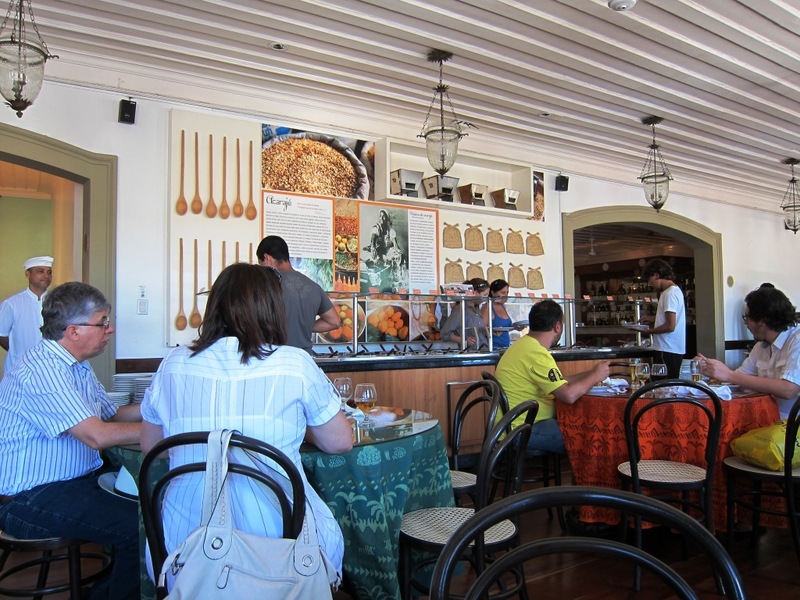 As far as places in Rio go, we definitely preferred Cida’s acarajé to the one we had previously sampled at the Feira Hippie in Ipanema (another high profile location). The acarajé was perfectly fresh and we enjoyed the good renditions of the traditional acarajé fillings: vatapá, caruru and salada. M also appreciated the spicy sauce with a nice kick. If you are going for the full authentic experience you must also top the acarajé with dried shrimp (though we are on the fence if we actually prefer this). In addition to acarajé, there were various chocolate and coconut cakes by the slice, cocadas and even small puddings baked right in a coconut shell. This was our friend M’s first venture into acarajé and we are happy to report that she heartily enjoyed it. Another Brazilian food convert won over! Value: Out of 5. Below R$3, 5/5; 3-4, 4/5; 4-5, 3/5; 5-6, 2/5; 6-7, 1/5; over 7, 0/5. Taste/Texture: Out of 15. We need a solid acarajé, not too mushy or too hard, and a fresh, baiana-made taste. Vatapá: Out of 5. How amazingly peanuty is it? How’s the texture? Did you let it sit too long in the sun? You will be harshly judged for messing up our favorite condiment; but handsomely rewarded if you do it well. Salada: Out of 5. Perhaps even more overlooked than Vatapá – salada is the Pico de Gallo-esque mix of tomatoes and cilantro that is supposed to add a little crunch to the mix. How fresh is it? Does it add anything to the acaraje or is it just a watery mess? Extras: Out of 5. Friendliness? Speed? Cleanliness? General awesomeoness of baiana outfit? Anything extra goes in this potpourri category. While we are in Salvador partaking in the city’s extensive acarajé offerings, visitors to Salvador for next year’s FIFA World Cup (possibly us!) will not have such an opportunity. For a series of complex reasons outlined by Jamie Anderson on her blog about life and culture in Salvador, the sale of acarajé will be banned within two kilometers of the refurbished Estadio Fonte Nova, the site of all the World Cup games here. Instead, McDonald’s – a major World Cup sponsor – will have full rights to all food distribution. As such, Bahia’s main street food – a major source of income for locals, and an integral part of the experience of Salvador – will be banned in favor of an American fast food establishment. Coca Cola’s recent billboard in support of baianas and acarajé (seen below) is a great commentary on the issue: Coca Cola claims it is working to “preserve this culture,” but what does it mean that a large corporate entity is working to preserve a culture of Afro-Brazilian street food? We’d like to think that acarajé is doing well otherwise, and will do even better if allowed to continue on its own terms. Needless to say, we at ETW do not support the move, and you can do the same: sign the petition at Change.org in support of baianas’ right to sell acarajé during the World Cup. One of our favorite treats in Bahia was acarajé, fried chickpea fritters. You can find acarajé stand on nearly every corner in Salvador da Bahia, however it is a little rarer in Rio de Janeiro. But fear not, we found a place to get our acarajé fix. There is an acarajé stand at the Feira Hippie “Hippy Market” in Praça General Osório, Ipanema, Sundays until 5 PM. While the main stock in trade at the Feira is clothing, bags and souvenirs, we were on a mission for another good for sale: acarajé. There are two acarajé stands bordering the feira, and we patronized the one closer to the beach, since it seemed to be doing brisker business. The stand itself is only there for the feira, but there is a complete setup – including the requisite vats of hot oil for frying the fritters. Each acarajé costs R$ 8 ($4 US), which would be considered highway robbery in Bahia. However, due to our hankering for acarajé, we thought it would be worth it for a splurge. Even compared to the acarajé in Bahia, we thought the Rio rendition was extremely delicious, and it was fresh out of the fryer. Along with the acarajé, you can get the traditional topping of peppers, salad and vatapá (a sort of condiment with shrimp and palm oil). The vatapá was fresh and we loved the fresh cilantro in the salad topping. So it may cost you double of those in Bahia, but Cariocas have a place to get an acarajé fix. 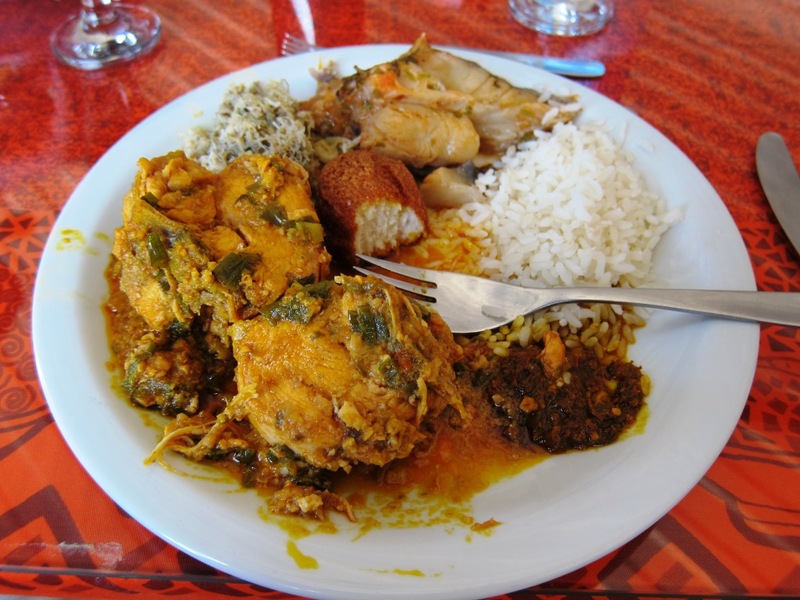 Regional Bahian cuisine has a flavor and style all its own in the landscape of Brazilian food. Its Portuguese and Dutch European backings, and Native Brazilian undertones and flourishes, and all heavily impacted by Bahia’s major western and central African influences. And you can experience the best of all of these wonderful flavors served up at the SENAC Restaurant School, which offers both “food by the kilo” and all-you-can-eat buffet options at reasonable prices. We opted for the buffet, run by the state restaurant school, and offering a wide variety (40+) of dishes including appetizers, mains and desserts, all prepared by students. The restaurant is open for lunch every day from 11 AM to 3 PM and the cost is 36 Reais per person as of writing (about $20) which is a pretty good price for an all you can eat buffet, even by Salvador’s very reasonable food prices. Moquecas – one of the classic Bahian dishes, the food everyone’s Mom makes best. Moquecas are usually seafood stews made with coconut milk, and garnished with farofa, carurú, cilantro, and tomatoes. SENAC also served a chicken moqueca, but in tasting this was indistinguishable from the xinxim. We can only assume that there is little change in variety each day, especially given the wide range of selections they already put out. We’ll readily admit that while none of the food blew us away, the price, variety, and very solid and tasty dishes definitely met our expectations. 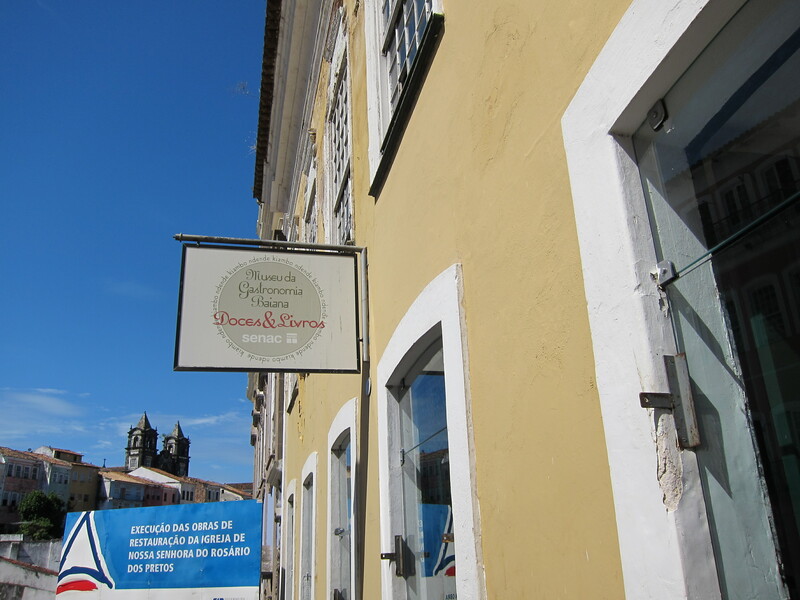 And in addition to the food, the view is nice as well – located on the 2nd floor of one of the Pelourinho district’s many restored colonial buildings, it looks out onto Salvador’s most famous square below, and the many windows provide a nice breeze. SENAC’s friendly waitresses are dresses as baianas, and are very attentive (drinks are extra, about R$2). So if it’s your first day in Salvador and need a reasonably-priced way to experience Bahian cuisine, head to SENAC. Both of the Eaters have arrived in Salvador da Bahia, Brazil – look for more Brazil-updated posts in the coming months. In the meantime, enjoy this song about Bahia, sung by Jorge Ben, that mentions some of the many delicious food items like Vatapá, Carurú and Acarajé.